Take advantage of these ready-to-use copywriter’s checklists, forms, contracts, templates and questionnaires (31 Documents in total). Everything you need to hit the ground running as a copywriter in one simple document pack. Starting out as a freelance copywriter can be daunting. You’re just finding your feet and you’re not sure what you need in the way of contracts, forms, templates and checklists. You want to look as professional as possible to your clients, and these documents help instil confidence in them that you’re the right copywriter for the job. This Copywriter’s Essential Documents Pack is something that I have personally collated with over a decade’s worth of experience as a freelance copywriter. These templates and checklists have enabled me to carry out copywriting projects for clients over the years which have generated millions of pounds in sales. Niches that these documents have worked include: Retail, pharmaceutical, healthcare, finance, banking, accounting, property, coaching, and online products. This documents pack is designed to help you hit the ground running, so you can focus on the fun part – writing copy! Copywriter’s Price Guide / Suggested Fee Sheet – This guide shows suggested fees you should be charging (from low-end to high-end), with fee guides for 50 different copywriting projects. Copywriter’s Contract – A simple contract that outlines the terms and agreements of the copy project between you and your client. Non-disclosure agreement – Ensure total privacy for your client’s project and their confidential data. Job Application Cover Letter – Standout from the crowd and every other generic copywriter. Demonstrate your copywriting expertise and land the job of your dreams at the same time. Cold Email Template – Break the ice and don’t fret about what to say to prospective clients to strike up conversation. Landing Page Template – No need to stare at a blank screen ever again. Follow this simple template to produce solid copy fast. … and every other essential document a copywriter needs to start and scale a successfull freelance copywriting career! 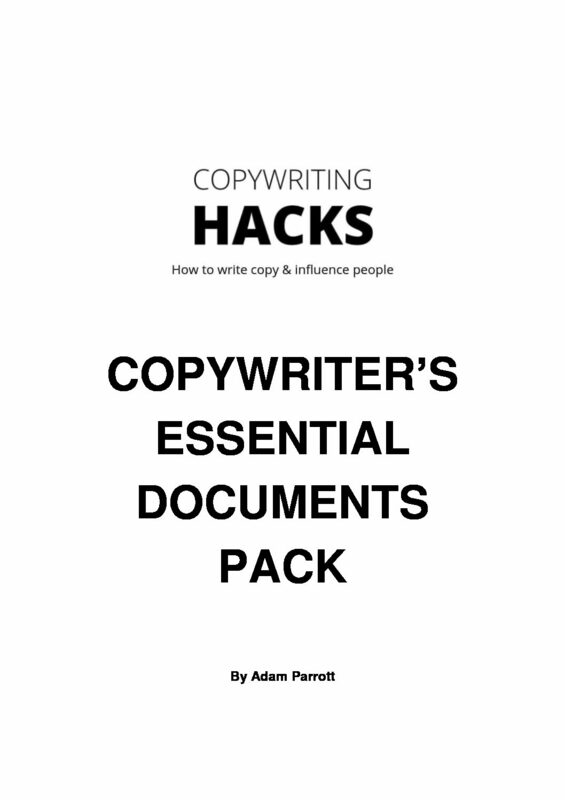 The Copywriter’s Essential Documents Pack is an 81 page, 31 document digital download. Which means you have instant access to the download. There’s no expensive shipping cost, and best of all, no waiting! The cover price of the Copywriter’s Essential Documents Pack is only $100. But act now, and it’s yours for only $49 – our lowest price! That’s a discount of 51%, less than half price off the regular price. This offer is only available to members of this group up until midnight on March 31st. After that, it goes up. To order the Copywriter’s Essential Documents Pack just click the “Add to cart” button now. P.S. – Don’t miss out on this special introductory price of just $49. This 51% discount is for a limited time only. Once this offer expires at midnight on March 31st, it may never be repeated ever again.